This past weekend, I realized I needed to seriously clip my oregano and thyme. Although I use them fresh in much of my cooking, the plants are growing faster than I can use them. So, I gave both plants a major hair cut! 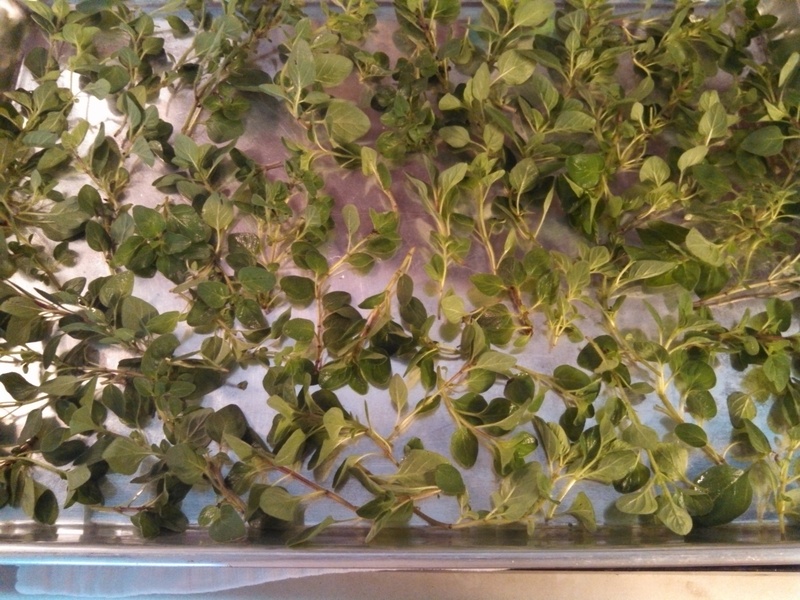 The picture above is what I harvested from the oregano and thyme. What did I do with the harvest? Dry it, of course. With herbs that don’t have a lot of essential oil, you could hang them to dry – unless you live in the South where the humidity makes the air thick enough to chew. So, for me, ALL my herbs have to be dried mechanically. The choices are an oven or a dehydrator. (Some sources say you can use a microwave, but I don’t think I want to nuke my herbs.) I do have a dehydrator, but I personally prefer the oven method. It’s simpler and takes less time because the oven is a bit warmer than my dehydrator. Once the oven is preheated, put your cookie sheets on the shelves in the center of the oven. LEAVE THE OVEN DOOR CRACKED OPEN! This is important because you want air circulation to help dry the herbs; you don’t not bake them. 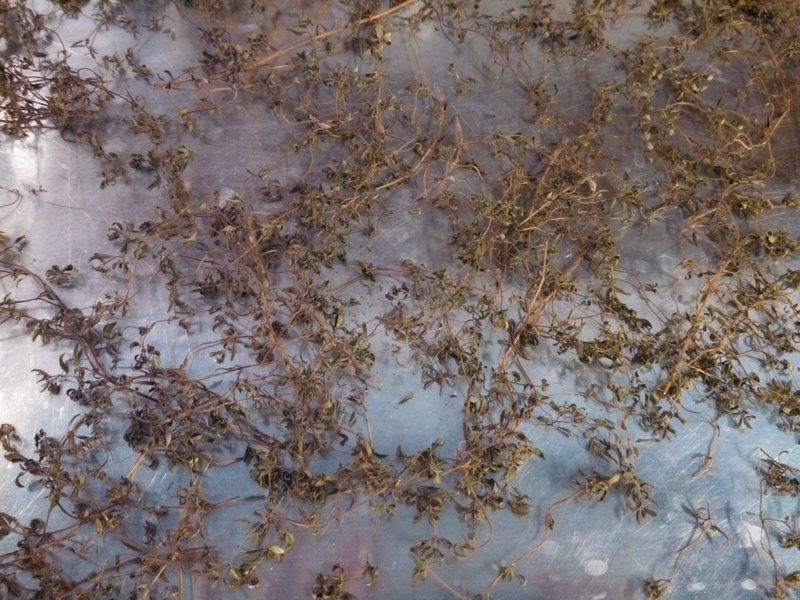 The time it takes for herbs to dry completely depends on the amount of essential oils in the herb. The amount of humidity can affect the timing, as well. Set your timer for 30 minutes, then check them every 15 minutes. When they look dry, remove a sprig to test it. It’s dry when you can crumble it in your hand. My thyme took about 45 minutes, and my oregano took 75 minutes (it has more essential oils than thyme). But that’s not a hard and fast rule, so be sure you monitor them. 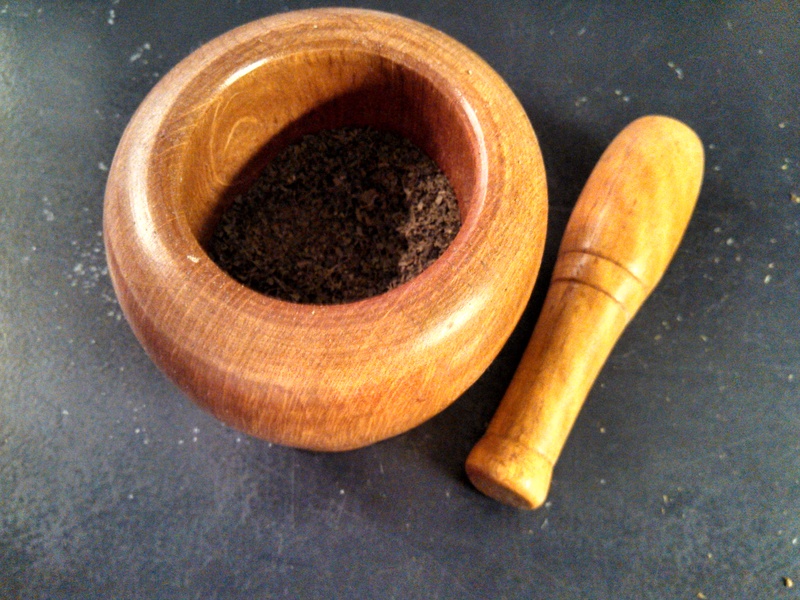 Once you’ve ground the herbs – coarse or fine, your choice – use a funnel and pour into your jar. Store in a cool, dark place. Do you grow your own herbs? How do you preserve them? thanks for the info. I’m sharing this with my husband. He grows the herbs at our house and I’m not sure he knows how to dry them properly. We don’t dry herbs anymore. In the summer, we use them fresh (of course.) We will make pesto with our basil and freeze it in ice cube trays. Because rosemary is not hardy where we live (upstate NY) we dig plants up and bring them indoors (fortunately my husband has a strong back) and use them through the winter. I have four rosemary bushes. I love it fresh, dried, and in flower arrangements. The smell is heavenly! They ARE hardy here in the south. Don’t feel bad. I planted extra dill this year so I could dry the dill weed. Work and life happened and now I have dill heads with less “fern” to harvest. I always say – if I could just be a stay-at-home woman, I could actually get so much more done around the house and garden! But I can’t retire and I haven’t met Mr. Millionaire. Lol. So we do our best. Drying herbs in the oven is easy..and it makes your house smell wonderful! Let me know how it works for you. Thank you so much. I have never grown herbs before and had no clue as to how to dry them. Your advice is extremely helpful! So glad you’re growing your own herbs. It’s wonderful picking fresh herbs to use in your cooking and to dry for use during the off-season. I hope you visit my site often. I try to post information that I’ve learned and found to be helpful. in my herbal medicine course we were advised not to crumble anything until just before use. The oils will evaporate and leave the flavour very weak. if you keep the leaf intact, the oils ail still be there ten years later (I just threw out oregano from 2003 and when it was crumbled it was just like new; really didn’t need to get rid of it, but I had new stuff, sooooo…). keep the bits intact as much as possible and rub you hands together to release the flavours just before use. Do not cook herbs much; add them to stews etc near the end, or add half while cooking and the other half at the end for a brighter flavour. Thank you for clarifying. I crush mine because I dry them in small batches which I use so quickly, so I didn’t think it would matter much. But yes, it IS best to not crush them until ready to use. 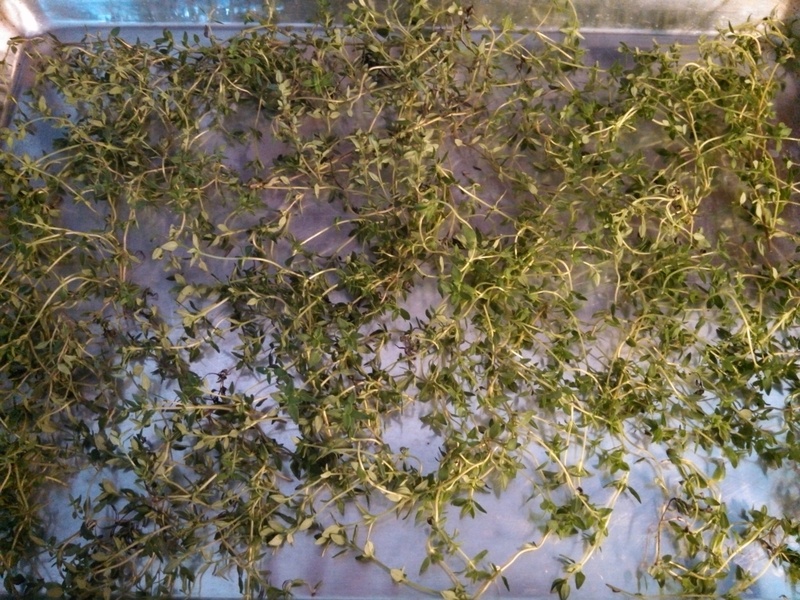 I just placed a few sprigs of bay leaf in the oven for drying – my first time. 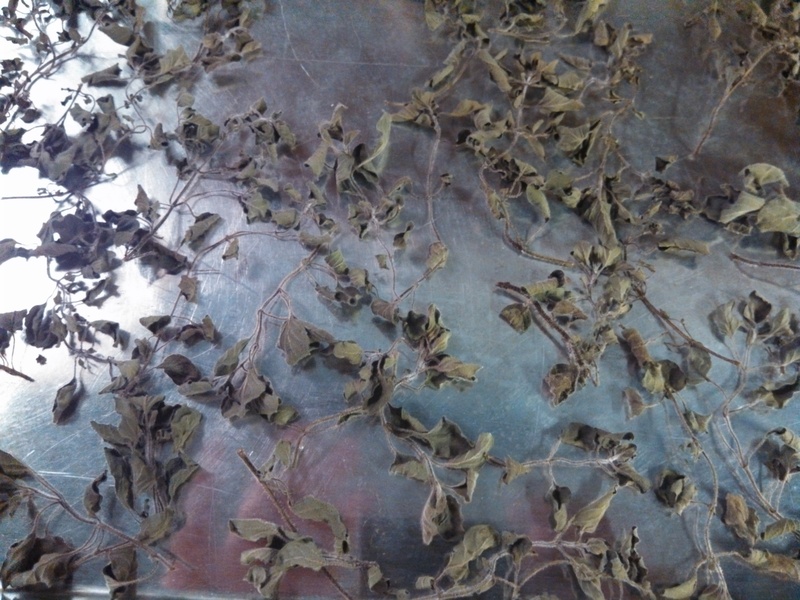 After they are dried, next is a sprig of stevia. I also have a rosemary bush, but need to google what I can use the dried rosemary (or fresh rosemary) for The only use I know for it, is to use it with roast lamb, but we don’t eat meat. It does have a lovely fragrance, so I sometimes put some sprigs in a vase and leave it in the kitchen window. Thank you for inf on drying herbs.I have had a herb garden for 10 years and I always freeze my fresh herbs,use then to cook ,.but now I want to show people my spice rack fulled with my herbs from my garden.I love cooking with herbs,no salt in my food.when using herbs,again Thank You. That’s awesome, Gloria. I love cooking with my own herbs. Drying them slowly in the oven not only helps you preserve the herbs, but it also makes the house smell wonderful! I have lemon thyme, sweet mint, basil, sage and rosemary to dry. Wondering if I can dry lavender as well. Sure, why not? It’s not really that different than drying rosemary. Thank you Rosemarie for posting this how to. A few years ago I air dried some sage and placed it in plastic bags. Somehow it lost it’s punch so this year I have a large amount of sage and will oven dry it and place it glass jars. Hi, Dawn. So glad I could be of help.